The winter season holds many gifts for beer lovers in the form of big, bold ales designed to fend off the cold chill of a long winter’s night. Each year, the Holiday Ale Festival annually gathers up dozens of these winter warmers for a joyous five-day celebration. As a result, this quintessential Portland event has earned a reputation as the premier winter beer tasting venue on the West Coast. 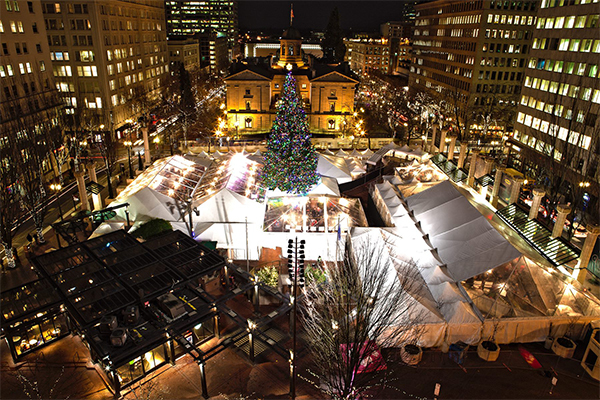 Held in the heart of downtown Portland, the Holiday Ale Festival keeps attendees warm and dry under a large clear top tent that covers Pioneer Courthouse Square while allowing for views of the city lights. Gas heaters create a cozy ambience under the boughs of one of the region’s largest decorated Christmas trees. More than 50 potent winter ales are featured at this year’s event, all of which are created specifically to bring warmth and cheer to the holiday season. These aren’t beers you’ll find in the supermarket – our brewers have put together special recipes just for the Holiday Ale Festival. From Belgians and Barleywines to Stouts and Sours, these beers are rich, robust and full of complex flavors. From November 28th through December 2nd, 2018, come hoist a pint and toast to the spirits of the season. We look forward to seeing you at the Holiday Ale Festival…Cheers! Despite being held outdoors during one of the coldest months of the year, more than 14,000 festival attendees stay warm and dry during the five-day festival under clear-topped tents that cover the venue. Gas heaters create a cozy ambiance beneath the boughs of the region’s largest decorated Christmas tree. In addition to beer and cider tasting, the festival also features meet the brewer events, a handcrafted soda garden, food vendors, cheese pairings, a coat/bag check, a raffle, and an iClick photo booth from The Oregon Lottery. The festival offers a varied collection of offerings, from Belgians to barleywines, porters to winter warmers, and sour ales to stouts. What makes this festival standout from other similar events is the selection: the festival works with every brewery involved to make sure they send a beer or cider that has either been made or blended specifically for their fans at this event or is a rare or vintage product that isn’t commonly tapped in the state. The Holiday Ale Festival is for ages 21 and over. Trying to decide what to do in Portland? Check out events like this one nearby our downtown Portland boutique hotel. A stay at Hotel Eastlund means you’ll be right across the street from the Oregon Convention Center, next to the Moda Center and have easy access to the best destinations, restaurants and attractions Portland has to offer. Whether you’re here for business, pleasure, or seeking event spaces in Portland, we look forward to helping you discover this beautiful city.